Originally written at Gypsy ReviewsScarlet is a much welcome change and adaptation of Robin Hood, I was delighted by the twists and turns of this novel and the surprises that came along with it. I never expected some of these changes and I was pleased at how well executed it was. 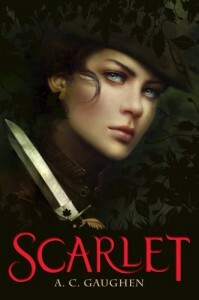 Having never been too much of a fan of Robin Hood, Scarlet sure has me hooked onto the series, leaving me craving for more and feeling very excited that it’s set in Medieval England.Scarlet, or otherwise known as Will Scarlet, is part of Robin Hood’s band of thieves and many don’t know it but Scarlet is actually a girl. There is much more than meets the eye when it comes to Scarlet who has a past that seems connected to the Thief Taken, Lord Gisbourne, who is hired by the Sheriff to capture Robin Hood and stop his band of thieves. But the complicated matter of the relationships between Robin Hood and John Little, one of Robin’s band, and Scarlet do pose an issue amidst the chaos to try and prevent the Sheriff from arresting everyone in the village come Tax Day. Scarlet not only has to deal with her head but her heart as well.Scarlet is tough and sees herself as one of the guys, she’s blunt and to the point in a way that is endearing. She is very stubborn and has a lot of pride and likes to take care of herself. She doesn’t like the fact that because she is a girl, Robin takes care of her. Rather she wants to be treated as an independent women, doesn’t help that she is in love with Robin. Scarlet is fearless and has a good heart, she refuses to let the people pay for what the Sheriff is doing to them and inside, it torments her that outside, people are starving. Scarlet is far from perfect though, she has done some things in the past she regretted and they do haunt her but we also get to see this vulnerable side of her.Oh boy Scarlet and Robin Hood. They’re both pretty stubborn and you know, I actually imagined Robin older until I realised this was a much younger version of him but his experiences, from going with King Richard to fight the Saracens, it changed him from a boy to a man. Robin is so self-sacrificing, he would do anything for the greater good even if it meant giving himself up. Then there’s John Little who is such a flirt but does all the things that Robin would never do – willing to make the first move and be straightforward about his feelings. I’m not gonna say too much on this love triangle though it’s so worth it in the end.It was slightly hard to adapt to the language used because the tense is changed in some sentences and the Grammar Nazi in me went RAWR in the beginning but as I got used to it, it was okay. The story was a little predictable but it was a quick read. I loved some of the action scenes and I really didn’t expect some of the twists and turns! Gaughen did a fantastic job with weaving in all the characters and putting her own spin to it. I would definitely recommend this to everyone, no matter if you’ve heard of the Robin Hood story or not.